Last month I completed the Transitions’ course that our church offers. I really enjoyed going to this every Sunday morning for 6 weeks. This is a video/workbook course designed to help LDS transition into a Christian church. There were a small handful of people in the class. I think a lot more would come if it’s advertised better. Anyway, here’s my write-up of it. I reported in last month’s newsletter that I wrote an endorsement for Adam Dommeyer’s new book, Almost a Mormon. This gave me the idea of starting to incorporate other Almost a Mormon testimonies into our monthly fellowship. I think it’s important for those struggling with the decision to stay or leave to also hear their perspectives as well. 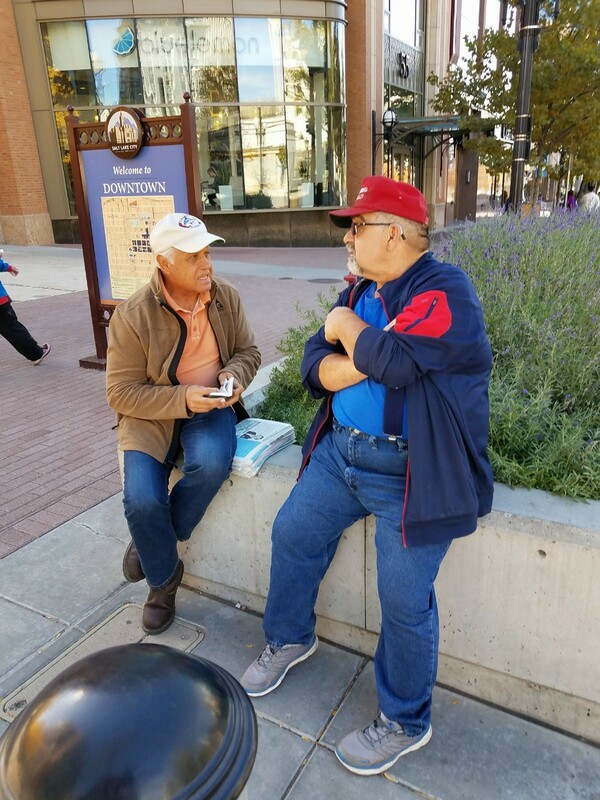 I also have come to see that some Mormons may feel more comfortable listening to these stories rather than ex-Mormon stories. My buddy and fellow board member of our ministry, Aaron Shafovaloff, came and shared how he was Almost a Mormon. You can watch his story here. My mom and dad came up for a while last month. My dad loves to fish, so we went to a few local lakes. My dad also loves to evangelize and has obviously had a significant influence on me and my love for sharing the Faith. 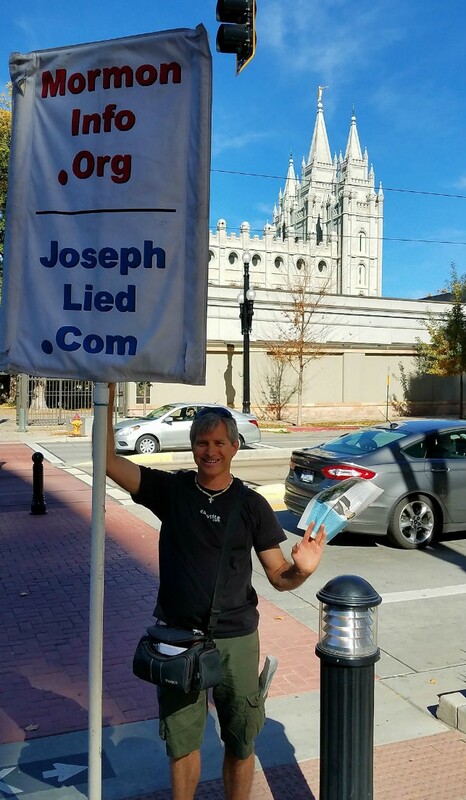 So we did some evangelism outside Temple Square one afternoon. Dad and I got to minister to a homeless brother and sister as soon as we got there. This created an interest in Dad for what’s going on with our local Rescue Mission, so we went over to see it and talk with someone there. Dad got to talk to a Church of Christ guy about baptismal regeneration. I really don’t care about these conversations, so I told this guy to go talk to my dad. These Church of Christ guys typically make such a big deal over baptism, and any other position is “as bad as the Mormons” as this guy said (even though LDS preach the necessity of baptism to make it to the celestial kingdom). I got to talk to an open Jewish lady with her atheist friend, and the latter basically wanted to set me straight. I pushed backed with how baseless her worldview is for human value even though I admitted a lot of theists are inconsistent on their worldview’s position on value. I also talked to another skeptic who thought I was nuts… especially after telling him that I was more sure that I had a mind than I had a brain. He also assumed the New Testament wasn’t written until hundreds of years after the time of Christ. I quickly dismissed this by telling him that Paul wrote most of the New Testament and he died in the mid-60s. Further, Acts never recorded his death, which it obviously would have… if it was written after his death. Also, the fall of Jerusalem was in 70 AD, and Acts never said anything about it. Certainly, it would have done so after the fact since Christ clearly prophesied this in Mat. 24. Now finally, Acts declares itself to be the second letter given to Theophilus. (Acts 1:1). Luke’s Gospel was the first (Lk. 1:3), and no scholar even regards Luke to be the first gospel. All this means that we have lots of good reasons to not believe the silly urban legend that the New Testament wasn’t written until hundreds of years after Christ. Instead the New Testament was written within the first century. Most of our manuscripts or copies of the New Testament come hundreds of years after the first century, but we still have earlier fragments dating either within or just after the first century. I talked to some others, particularly Mormons, but none of them would bite! Tomorrow our family leaves to speak at a church in Escondido, CA. Next week I will be going down to the Cedar City, UT temple opening. I will also be speaking in St. George at the end of that trip. I need the funds to go, so if God moves you, please send in an investment today! I am an RN and a Legal Nurse Consultant and I thought you might be interested in a document I compiled. The document is a 316 page compilation of quotes from Public Documents which include Legal Complaints; Appellate Court Rulings; Rulings on Legal Motions; Newspaper accounts; and the Boy Scouts of America Ineligible file documents. The document spans the years 1959-2017. All links are provided. This is the first Church I have researched and I intend to continue this type of research with other churches and organizations. The document is a living document and I will update from time to time. People have contacted me in order to add an instance of sexual abuse to this document by emailing me at: LDSLivingDocument@gmail.com . I have included two links because one may be more readable to you than the other. Praying for much support and a great and successful temple mission trip. Here is a test of the Book of Mormon (BoM) that I challenge someone with the means to do. The BoM describes 3 civilizations that came to America from the Old world: Jaredites, Mulekites and Nephites. The Jaredites and the Nephites ending up having a great war that killed off most of all of their people. The BoM states that both of those wars occurred in the same place, at a Hill in New York that Nephites/Mormons call "The Hill Cumorah". The Jaredites called it "Ramah". These two wars were approximates 1200 years apart. It should be easy for an archaeologist team to create digs around the Hill Cumorah to see if these wars happened. The last of these wars was in 600 AD. The dig needs to be deep enough to expose 4000 years at least. There should be 2 distinct strata in the earth where there are many skeletons with accompanying armor and weapons, and the accessories in these strata should reflect different technologies. This is not hard to do people! Hear me, prominent anti-Mormons! Hire Mormon archaeologists to do this. Make it a huge media event. This will be FUN! Through my research about Mormons I have come to conclude that while Mormonism is false, it does carry with it some excellent teachings and doctrines about the afterlife. Christianity in my view does not have all the answers either. I am very curious as to what made you help develop this organization and why spending time pulling Mormons over to "Christianity" is so important, when in fact they already believe in Christ? I have done a lot of research about all religions. And I am skeptical of all organized religions and their intentions. Just curious what makes your group and religion different and better from Mormonism, Muslims, Jews, or any other world religion? [I replied:] Fair questions. I also grant Mormonism has many good things to it, including some doctrines. However, since it teaches a false god, false Christ, false Holy Spirit, false gospel, has false scriptures taught by false prophets, then it's something Jesus warned us about when He said to beware of false Christs and false prophets who come in the last days (Mat. 24:24). If you want more specific details, then please read my Home page chart of differences. Satan can appear as an angel of light (2 Cor. 11:13-15). Knowing the only true God and Jesus whom He sent is what eternal life is (Jn. 17:3). You commit to a false god, then you can't have eternal life and your troubles will be multiplied (Ps. 16:4 and 1 Cor. 6:9). I don't look to my religion for all the answers. For example, I didn't learn 2+2=4 from Christianity. However, I look to Jesus for my salvation in making me right before God. Jesus claimed to be the Truth (Jn. 14:6) and God in the flesh (Jn. 8:24 and 58 and Jn. 10:30-35), who loved me enough to die for all my sins. I believe Him since He fulfilled all sorts of prophecy given of Him in the Old Testament and because of the miracles He did, primarily raising from the dead. He's become my Lord and as His disciple, I'm instructed to teach everything He taught (Mat. 28:19), and that includes warning others of counterfeits. He loves you as well and desires you to trust Him. You may be interested in checking out my other sites: www.CourageousChristiansUnited.org, www.JWinfo.org, and www.MuhammadLied.Info. [He replied:] Thank you for the response. To be honest I did not think I would get one. I appreciate your time in responding. While I am skeptical as to there being one true God, I am always open to other thoughts and possibilities. Organized religion to me seems unnecessary. Simply looking for the truth seems to be enough for me. I will read up a little more on what you guys do so I can be better informed about you. [I replied:] Well I think organized religion sure beats disorganized religion. I think it's clear that Christ taught He would build His Church (Mat. 16:18), so He's the organizer and not a God of confusion (1 Cor. 14:33). We as believers are the Body of Christ or the Church (1 Cor. 12:27), however, He calls us to submit to our elders to help us become more like Christ (Heb. 13:7). We have a head coach as well as assistant coaches. The Proverbs has much to say about having a teachable spirit, and we are told not to forsake the assembly of ourselves together with other like-minded believers (Heb. 10:25). Education and restoration is best in a communal project. If you haven't seen The Case for Christ yet, I highly encourage you to rent it from Red Box now. It's a superb film, and I think it will be a tremendous help for you. You might want to consider listing my website on your listing of sites critical of the Mormon Church.